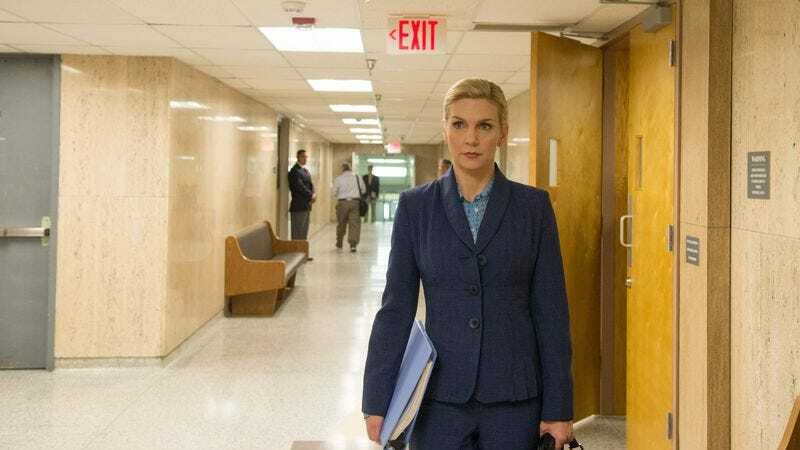 When Better Call Saul introduced the character of Kim Wexler, hardworking fourth-year associate at Hamlin, Hamlin & McGill, some viewers might have seen the invention of a love interest for the future Saul Goodman as right out of the standard prequel playbook. And other than a shared history in the HHM mailroom and a taste for smoke breaks in the underground parking level, in season 1 we didn’t see a whole lot of what drew them together as a couple. 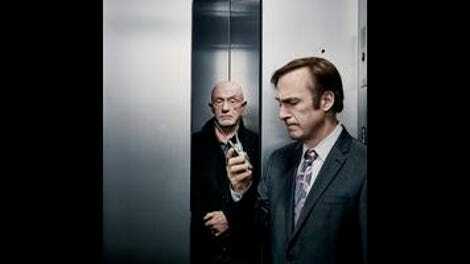 But this season, it seems like every episode brings a new dimension to their relationship. And those dimensions put to rest any worries that Kim might be merely a conventional bit of backstory for our hero. We watch her putting on her corporate uniform for a day in the salt mines, brushing her teeth alone, and deciding not to listen to the blinking answering machine. We know she’s thinking about that moment in “Switch” when she and Jimmy agreed—leaving so much unspoken—that they couldn’t repeat the thrill of grifting KENWINS every night. And then the camera never leaves her as she listens to Jimmy crooning “Bali Ha’i,” and we see in her face what brings them together. He makes her laugh. His devotion is a rock on which she depends (but of which she worries about taking advantage). Her law firm has just betrayed her trust, but Jimmy never would. And so she regrets pushing Jimmy into the treacherous, suffocating arms of the respectable practice of law. All that with no dialogue whatsoever. Writing for Indiewire last week, Emma Dibdin calls BCS “one of the most feminist shows on television,” and while that’s a high bar to reach when overtly feminist, woman-created shows are proliferating on various cable outlets, she makes a strong case. Dibdin points out that Kim is “single, childless, and unconcerned by her biological clock,” with zero screen time spent on anxieties about any of those ubiquitous sources of feminine motivation. Neither does her devotion to her work make her one-dimensional or unfulfilled; instead, it reflects her self-definition as a professional. The only way her gender enters into it is that she believes she needs to play the game without any mistakes, staying later, working harder, and complaining less than her male counterparts, to get the same rewards. That’s a bind that women (and other minorities in the workplace) readily recognize. Portraying that reality as the central concern in the life of a television character probably shouldn’t be revolutionary. That doesn’t make it any less thrilling to witness here. Contrast the sweet, sincere, self-aware-but-screw-it tenor of Jimmy singing over the phone line, with the icy shoulder of Howard Hamlin. The pointed silence, the stonefaced stare, for agonizing seconds as they walk through the office. And then the sudden rearrangement of his features into a welcoming smile as they turn the corner to meet the clients. It’s perfectly conceived by writer Gennifer Hutchinson and staged by director Michael Slovis, who has the camera retreat before them in the twists and turns of the office suite like a classic John Wells walk-and-talk—except with no talking. Watching their faces, we see everything. All show. No tell. The silent treatment is all the more powerful because the world inhabited by Jimmy, Howard, Kim, and Chuck is so dominated by talk. Where we’re accustomed to being dazzled by economy of storytelling is in Mike’s storyline, in details like the carbon-paper-under-the-doormat trick that short-circuits the Salamanca gang’s usual intimidation protocol. As Operation Tuco proved, it’s when Mike acts voluble that you’re in trouble; if he’s grunting out incomplete sentences, he means exactly what you think he means. Even in a world that contains the unstoppable killing force of the Cousins (who make their inevitable appearance appropriately horrific: silhouetted against the sky, pointing a finger-gun at Kaylee as she plays in the pool), Mike can still credibly project a man with nothing to lose, earning Hector’s respect. Nothing he does is a bluff, even when it’s a gamble. His sense of honor is similarly uncomplicated, leading him to refund Nacho the $25,000 he charged for the Tuco job. In the final reckoning, it must be satisfying that Mike got Hector to pay for a hit on his own nephew. Mike’s dealing with a more complicated future than he wanted; he’s mixed up with a dangerous gang, he knows secrets that could put him and his family in danger, and to top it all over, his body might be failing him at precisely the wrong time. But Kim and Jimmy are struggling to carryon as if their choices are simple, black and white, right and wrong. Kim listens to a spiel from Schweikart for a partner-track job, even though she protests that she owes her loyalty to HHM for funding her legal education while she worked her way up from the mailroom. (Watch how the camera lingers on Kim’s face listening to Schweikart’s monologue. Just like in the cold open, her expressions tell all the stories she’s hearing, imagining, and telling herself.) But what she really wants isn’t a different job. It’s the freedom that Schweikart displays—to drink a Moscow Mule in the middle of the day, out of a copper mug, just like when the drink was invented in the fifties. To be an interesting individual, not a wardrobe of pencil skirts hauling around her office in a document box. And that freedom whispers its seductive song less in the prospect of a career upgrade and a partner track, than in the improvisational thrill of seeing an opportunity and grabbing it. When a handsome philanderer buys Kim a drink moments after putting another woman in a car outside, she knows—thanks to Jimmy—what he deserves and how to make him pay. Jimmy can’t bolt out from under Erin’s oppressive clipboard fast enough when he gets the call. Giselle and Viktor are back, and that old thrill now has a sharper, sweeter taste. Neither of them can lie convincingly, to themselves or each other, that they’re happy slaving away for hypersensitive, unappreciative bosses. If the mug doesn’t fit, you must whack the tar out of the goddamned metric cupholder with a lug wrench until it does. Or ditch the company car and go for a float, metaphorical or otherwise. The cupholders on those pool loungers are mighty accommodating. One of my favorite shots in the episode is in the cold open, during Jimmy’s insomnia sports montage, when those stupid wooden balls come bouncing down the stairs and Slovis cuts away just as they reach the camera position. The blue swirl is back! Davis & Main spent a lot of time back in the mesothelioma days making sure that swirl was “nebulous but not too nebulous,” so it’s a sign of their commitment to ecological sustainability that they would reuse it for a Sandpiper ad. Another terrific show-don’t-tell moment: Kim hauls her stuff back to the empty office, back in HHM’s good graces for the moment. But she decides not to hang her diploma. Who knows how long she’ll be allowed to stay? A pointed contrast to the unrushed lunch with Schweikert: Howard sends a minion to tell Kim to work through lunch, offering to order in from the “fancy new salad place” that just got approved by Accounting. Cheap and insensitive! Folks in the comments last week were wondering about the timeline of Kim’s career, and the scene with Schweikart sheds some light on that: She’s been at HHM for ten years, six in the mailroom (during the last few of which, presumably, she was also attending law school) and four as an associate. Terrifying to see Mike’s hand trembling uncontrollably after he sends the Salamanca goons packing. If there’s one thing we count on in the Gilligan-verse, it’s that Mike Ehrmantraut is always in control. As many of you noted after “Amarillo,” Jimmy and Kim’s Ice Station Zebra home video date prefigures Saul Goodman’s Ice Station Zebra Associates front company in Breaking Bad. We see the birth of that trademark tonight, when Viktor and Giselle’s mark Dale makes out his $10,000 check to ISZA. Music notes: You probably recognized the oft-covered steel guitar classic “Sleep Walk,” by Santo and Johnny, during Jimmy’s insomnia montage. The Bollywood-type number playing as he and Kim go their separate ways at the end is “Henna Henna” by the Bombay Royale. “Try harder next time,” Mike snarls at the Salamanca thugs who were trying to scare him. “Next time” is the cousins on the roof, so—yeah, they tried harder.